Last year at Christmas I found this recipe for a cake made with chestnut puree and chocolate. At the time chestnuts were not something that I often had at all, in fact I don’t know when the last time I’d had one would have been prior to that. In the picture the cake looked nice (of course it did…it was chocolate)but upon making and devouring it, it turned out that it was absolute heaven. Since then I’ve had a bit of a thing about chestnuts. So when I came across a mention in an Italian cook book of chestnut flour I was thrilled. This new discovery was not only a new way to use chestnuts, but also a new flour to try out (I’m a tiny bit obsessed with flour in all it’s wonderful variations if you hadn’t noticed). When I first discovered this I raced to the health food store and was crushed to discover that chestnut flour is a tad on the pricey side (to say the least) and we’re sadly just not in a position to splash out on pricey flour. So I stowed away this new obsession for a wealthier day and made some buckwheat granola instead. Having nearly forgotten about the whole thing, I was elated when I walked into the store the other day and found a bag of chestnut flour in the half off bin! I leapt at the opportunity, rushed my exciting flour home and… realized that in my excitement to try this glorious flour I’d completely failed to consider; what can you even make with chestnut flour? As it happens, chestnut flour has been in wide use -so much so that it has been an historical nutritional cornerstone for some cultures, especially it seems in Italy- for centuries (here’s an interesting account from 1910 of chestnuts in Tuscany). It’s only really since the Second World War that this once prolific ingredient has all but disappeared. As chestnuts were a widely available and cheap ingredient in Italy, they were used both in their whole form, and in the form of flour in a huge variety of recipes, everything from bread to cake, gnocchi and pasta, stews, soups,pudding and…biscotti! When I read that you could make biscotti from chestnut flour the decision was a clear one. I love biscotti. For me it’s ubiquitous with the many, many coffee shops of Vancouver (and everywhere else probably too, but hailing from Vancouver it does elicit happy BC cafe memories). I had always believed that biscotti was originally meant for dunking in coffee, but actually in Tuscany it seems they’re served alongside fortified wine! What ever the case may be, these oblong, crunchy, twice baked biscuits are lovely dunked in coffee, tea, hot chocolate, and -it appears- the traditional Tuscan tipple as well. 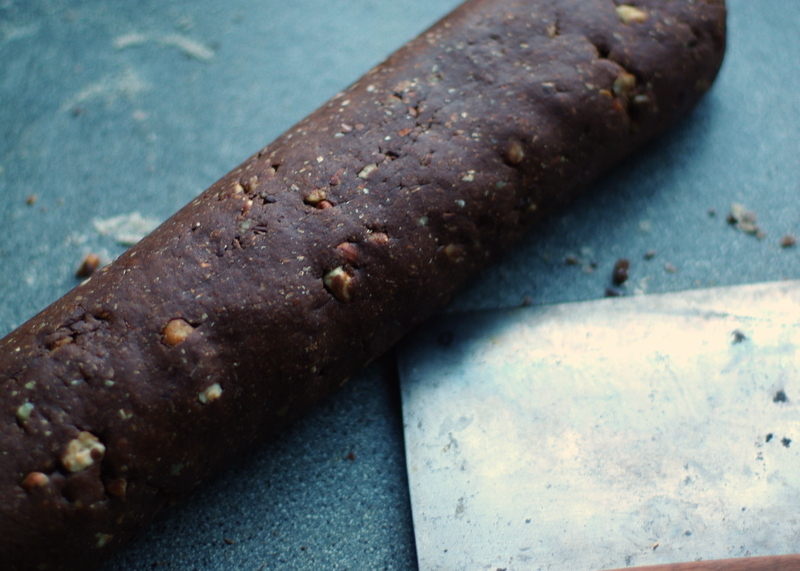 I went for chestnut flour chocolate hazelnut biscotti because…well really… they’re chocolate! The chestnut flour is lovely in them. Because it’s gluten free, the chestnut flour does make them a bit more crumbly than their wheat-y equivalents, but also adds a lovely sweet depth to the flavour. You could probably make these solely with chestnut flour if you wanted a gluten-free and paleo option, but would maybe have to add a bit of xanthan gum to help to hold them together. After the lovely chestnut flour chocolate hazelnut biscotti I still have half a bag of chestnut flour left!! Happy days! Now just to decided what to try and make with it next. I’m sure something will pop up here shortly, but in the mean time, Saluti to biscotti and to chestnut flour! 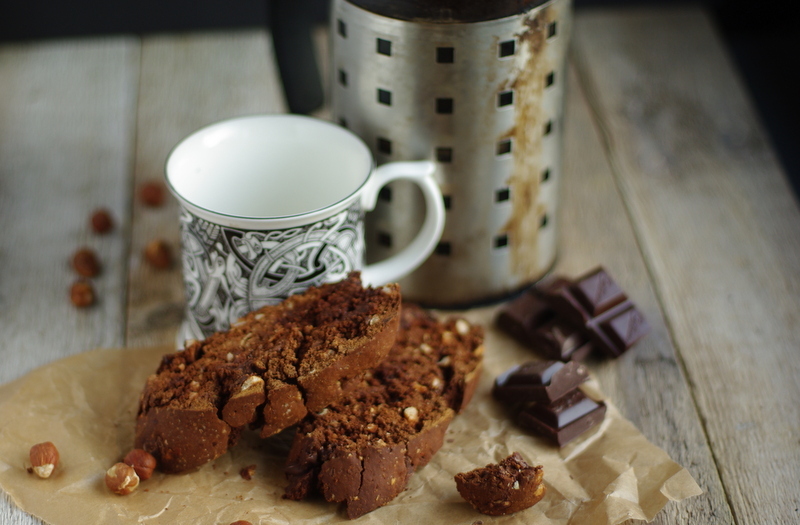 Crunchy, healthy chocolate hazelnut biscotti made with sweet and traditional chestnut flour. A perfect biscuit for dunking! Pre-heat the oven to 180 degrees Celsius and line a baking tray with non-stick baking parchment. Sift the flours, baking powder and cocoa into a large bowl and mix to thoroughly combine. Make a well in the center. Combine the eggs, honey, and oil in a jug and beat until evenly combined. Slowly add the liquid ingredients into the well in the dry ingredients stirring carefully to draw the flour mixture into the liquids until the liquid is well combined. Turn the mixture onto a work surface and knead it for a minute until it’s smooth and evenly combined and then knead in the chocolate and hazelnuts until they’re evenly distributed throughout the mixture. The dough should be quite stiff and will be a tiny bit crumbly. Firmly form the dough into a log and place it on the prepared baking tray. Place it in the oven and allow it to bake for 20-30 minutes until it’s firm and looks dried out and cooked on the surface. The surface may have split, which is fine. Remove the tray from the oven and leave it to cool for 10-15 minutes until cool enough to handle, but still warm. With a sharp serrated knife cut the log on long diagonals about 2cm thick and place each of the biscuits back onto the baking tray. Return them to the oven and leave them to bake about 15 minutes more until they’re quite hard and crunchy. Leave them to cool on a wire rack and serve with a cup of coffee, or another favourite drink for dunking!